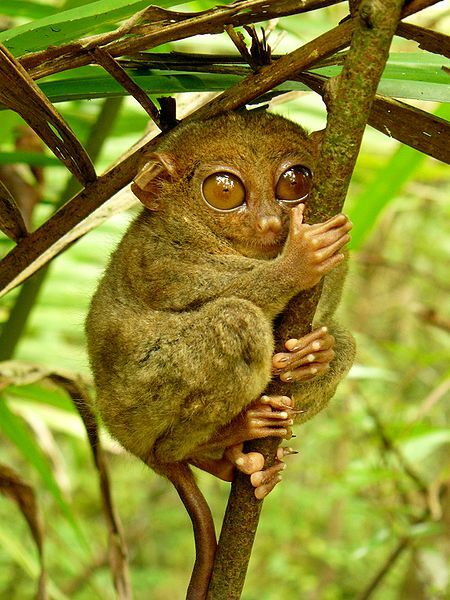 Tarsiers are small strange primates of the genus Tarsius, a genus that belongs to the Tarsiidae family, which is the only surviving family within the infraorder Tarsiiformes. Although the various Tarsier species were once more widespread, today they can only be found in the islands of Southeast Asia. To be more specific they can be found in the archipelagos in southeast Asia, including Sumatra, Borneo, Sulawesi, and some parts of the Philippine Islands. Tarsiers usually live in tropical and forested habitats that have dense vertical growth. Their head and body has an average length of 10 to 15 cm in length and the hind limbs are about twice this long (including the feet), . 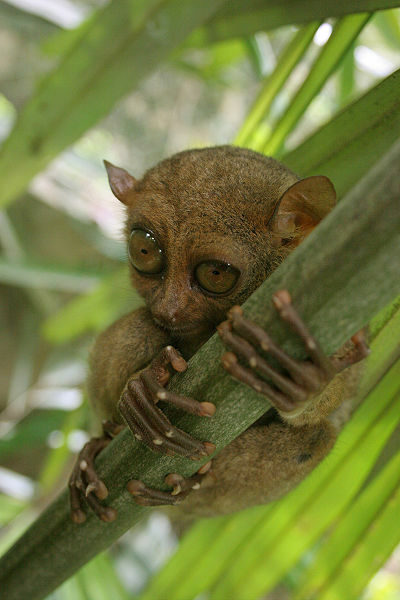 Their hind limbs are quite long with extremely elongated tarsus bones, thus the "tarsier" name. Their slender tail ranges from 20 to 25 cm in length. They have elongated fingers, with the third finger having about the same length as the upper arm. Tasiers have an average weight of 80 to 150 g. Tasiers have been reported to live up to 16 years of age. Tarsiers have soft and velvety fur, which is generally buff, beige, or ochre in color, resembling the color of dead leaves or bark. Species that live in higher altitudes might have have curly hair. Tasiers are known for their round heads with large eyes that are directed forward. Each of their eyeball has an approximate diameter of 16 mm approximately and ,depending on the species, it can be as large as their entire brain! In constrast to most of the nocturnal vertebrates, tarsiers don't have a light-reflecting area (tapetum lucidum) of the eye and have a fovea(fovea centralis). Tarsiers are the only surviving carnivorous primates species. They mainly eat insects, and catch them by jumping on top of them. 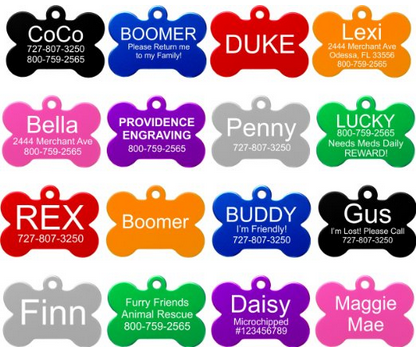 They also feed on birds,lizards,bats and snakes They are also known to prey on. They have also been observed jumping and catching birds on motion! 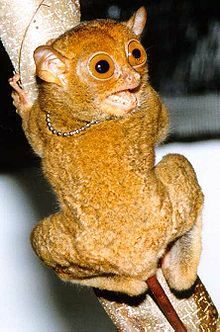 Sexual maturity is reached by the end of the second year while gestation lasts for aboutsix months, and tarsiers usually give birth to only one offspring. The younglings are born furred, and with their eyes open. Younglings are even capable of climbing trees from the first day! Farmers killing them cause they thnk that tarsiers eat their crops. However tarsiers only eat animals organisms including pests that might actually harm crops! Natural Disasters, like forest fires. If you enjoyed reading about the Tarsier please consider supporting our blog by sharing it with your friends using the buttons below!